Allow yourself to be swept away by the mysteries of Tibet and the attractions of the Riviera Maya at the fascinating Second Mayan-Tibetan Bicultural Encounter at Hacienda Tres Rios hotel, where a community of Tibetan monks will guide you through a fantastic program of activities. The Mayan philosophy combines mankind with the earth, unifying the human spirit with its surroundings. This concept is shared by the Tibetan culture, along with the tendency to express the inner spirit through the arts. With this view in mind, Mayan philosophy incorporates dance, song, ceremonies, artwork and writing, just like the Tibetan culture. 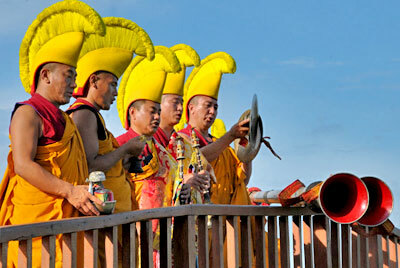 You can discover, witness and even participate in the excitement at the Second Mayan-Tibetan Bicultural Encounter. From September 11 through 16, 2012, the Hacienda Tres Rios hotel will open its doors to a community of Tibetan monks who will travel to this mystical part of the Riviera Maya, allowing us direct interaction with the Lamaist culture. With the monks, you'll have the chance to create mandalas, participate in spiritual ceremonies, experience the meditation process and be blessed in a "Tibetan puja", among many other activities that open the doors for spiritual enlightenment. The teachings and sophistication of Tibetan artwork and culture have been showcased in western culture for many years by Richard Gere Productions, this time joining with Arte Maya Productions through Mary Coba Cupul in the majestic setting of the Riviera Maya. You'll have the chance to experience the Second Mayan-Tibetan Bicultural Encounter first-hand, with an extensive activity and ceremony program focusing on the spiritual rebirth of today's world. Allow yourself to be swept away by the mysteries of Tibet and the attractions of the Riviera Maya at the fascinating Second Mayan-Tibetan Bicultural Encounter at Hacienda Tres Rios hotel.